The Western Kentucky Hilltoppers take on the Vanderbilt Commodores on Thursday at Vanderbilt Stadium. Western Kentucky finished with a 8-5 record last year while Vanderbilt ended up at 3-9. The opening line for this game has Vanderbilt as 3.5 point favorites and the over/under was set at 73. The Hilltoppers had a 6-7 ATS record last season, which meant they covered the spread 46% of the time. Their over/under record finished at 9-3. The Commodores covered the spread 50% of the time, finishing the campaign with an ATS record of 6-6. Their over/under record was 5-7. Western Kentucky averaged 44.4 points per contest last season on offense. In the passing department, they completed 29.1 passes per game on 42.8 attempts for a 67.9 percent completion percentage. They averaged 374.3 yards and 3.8 touchdowns per game through the air as well. The Hilltoppers rushed for an average of 160.3 yards per contest on 33 attempts for an average of 4.9 yards per carry. This equated to 1.6 touchdowns per game on the ground. They also ran 75.8 plays per game last season and averaged 7 yards per play for a total of 534.6 yards per game. The Hilltoppers averaged 27 first downs per contest and turned the ball over 1.4 times per game. They averaged 57.2 penalty yards per game via 5.8 penalties. Western Kentucky allowed 289.2 passing yards per game and 39.9 points per contest on defense. They gave up 20.5 completions on 32.3 attempts for a completion percentage of 63.6.The Hilltoppers gave up 220.8 rushing yards on 44.3 carries for a 5 average. They allowed 2.5 rushing touchdowns as well.Western Kentucky gave up 509.9 total yards per game last year including 6.7 per play. They forced 1.8 turnovers and 6.5 penalties for 57.2 yards as a unit. Vanderbilt averaged 17.2 points per contest last season on offense. In the passing department, they completed 15 passes per game on 29.8 attempts for a 50.4 percent completion percentage. They averaged 179.1 yards and 1.1 touchdowns per game through the air as well. The Commodores rushed for an average of 109.3 yards per contest on 31.9 attempts for an average of 3.4 yards per carry. This equated to 0.6 touchdowns per game on the ground. They also ran 61.7 plays per game last season and averaged 4.7 yards per play for a total of 288.3 yards per game. The Commodores averaged 16.1 first downs per contest and turned the ball over 2.4 times per game. They averaged 52.5 penalty yards per game via 6.1 penalties. 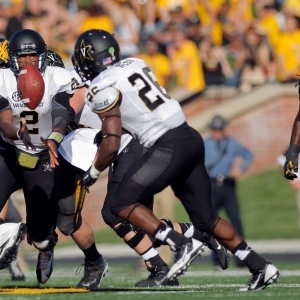 Vanderbilt allowed 218.3 passing yards per game and 33.3 points per contest on defense. They gave up 17.9 completions on 28.8 attempts for a completion percentage of 62.1.The Commodores gave up 183.8 rushing yards on 41.5 carries for a 4.4 average. They allowed 1.9 rushing touchdowns as well.Vanderbilt gave up 402.1 total yards per game last year including 5.7 per play. They forced 1.1 turnovers and 6.4 penalties for 51.3 yards as a unit.